Wondering what an immersion language course is like? British students tell their stories. 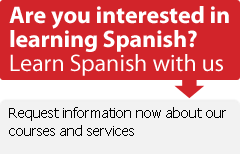 If you're not quite sure what to expect from an immersion Spanish language course, you might enjoy a read through this page on don Quijote's UK site. Britons who have studied with dQ in Spain tell their own "learning Spanish" stories. The page offers more detail than the quick student testimonials on the main don Quijote website. If you're really stuck choosing a school or destination, or if you'd just like to talk with someone who's taken an immersion course before deciding it's for you, you can e-mail many of the students who have left comments on the website, or ask the dQ course counselling team for the contact info for a former student of your nationality, age or level of Spanish at the beginning of the course. Or you can leave me a comment here. I managed to learn Spanish well enough to land a job in Spain….despite starting my study of Spanish at the ripe old age of 38. I started back in 2001 with a 2 month in-country course. I don't believe there is a better way to learn a language than by living immersed in it, for a couple of weeks to as long as you've got. And for me, learning the language was only a small piece of the friends and life-changing experiences that first immersion course brought me. Transitions Abroad is a good stop to make while thinking about language travel, as well. Scroll down a bit on this page; past the commercial stuff, you'll find a nice collection of articles about in-country language courses.